Below, we briefly discuss the Volkswage Type 2 (T2) model, Westfalia Campervan and other professional / private conversions. 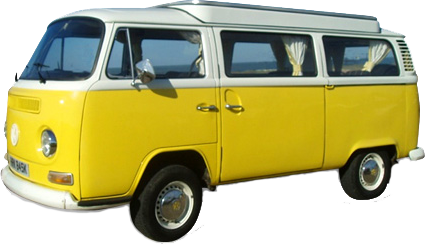 We also list key features and specifications for the VW Microbus along with the most popular VW Bus Camper locations. The second generation T2 was launched in late 1967 for model year 1968. The VW Type 2 T2 was produced for the US market in Germany until 1979 in which during that timeframe it went through many minor modifications and cosmetic face lifts. Pre 1971 models are commonly known as T2a or Early Bay models while 1972 through 1979 models are known as T2b or Late Bay. The distinct changes with the second generation VW Microbus was the abandonment of the iconic split front window from previous models. This was substituted with a large bay window thus the use of the word Bay in the previous nicknames. Other major changes included a larger size and engine along with half-shaft axles fitted with constant velocity joints. This allows for a higher ride height without camber issues. Westfalia camping van known as the “Westy” were popular factory variants where Volkswagen contracted the Westfalia-werke company in Rheda-Wiedenbrück. 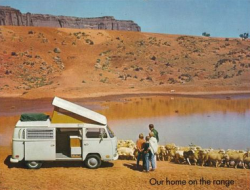 Westfalia was the official camper van conversion company for Volkswagen and produced thousands of bus campers with the trademark Westfalia roof and interior. They started converting VW buses into campers with the first generation T1 and continued until 2003. Besides Westfalia other companies over the years (such as Riveria), have produced VW Buses converted into camper vans. This was and still is a common practice for private owners. This is more so the case with the VW Bus then many other vintage vans. Each one of these homemade conversions are custom and suited to the individual owner’s needs. Check out our Manuals page for a comprehensive DIY guide on how to do this. Listed below are the top ten states where Volkswagen Microbuses are the most sought after in the US. See our For Sale page for current VW Camping Microbuses for sale.